Teaching – very often, the college where you trained, and who know you, may be interested in your returning to assist with courses that they run. Once you have a little experience under your belt, you can offer your experience more widely. Supervision – many therapists go on to undertake supervision training, and help other therapists in this way. Corporate work – many companies now like to offer stress counselling to staff members – often to pre-empt litigious staff members who may feel that their work load is unacceptably stressful. GP work – it may be worth enquiring whether your local surgery could use your services one or two days a week. Training – using your counselling skills to develop courses and workshops for other counsellors or, again, corporate settings. Writing – there are a variety of publications who are pleased to accept original work for publication, and, as you become more experienced, who knows, you may even write a book. Specialist “Consultancy” work – alongside, say, solicitors who may like to call on you where there are psychological issues, and where your freelance services are a useful adjunct. 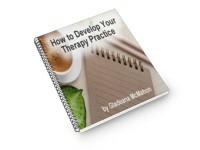 This post is the final part of the free E-Course “How to Develop Your Therapy Practice”. I hope you’ve found it helpful. Remember that each lesson only covers the bare essentials of what you need to learn and should not form your only source of information. For the complete detailed guide which takes you through each step of setting up and building a successful Therapy Practice – click here. Is Private Practice for You? What are the Initial Considerations? Hi Gladeana many thanks for the updates on expanding your practice – they have certainly made me think about some different things & also confirmed I’m on the right lines with others – thanks for sharing these with others.